The Carpet and Rug Institute (CRI) is your foremost source for carpet cleaning information - based on fact and science. Sears’ Platinum Certification means consumers can rest easy in their decision to choose Sears carpet cleaning services. We use only industry-leading products and the best carpet cleaning equipment to make your carpets cleaner and your clean last longer. Consumers get a healthier environment in which to live and work, plus a maximum return on their carpet cleaning investment. If you’ve been searching for the “best carpet cleaning near me,” search no more. Call Sears today for our certified carpet cleaning services. Allergens, dust mites, dirt, and pet dander build up in carpets over time, leaving them grimy and discolored. Our two-step, professionally-recognized carpet cleaning services can extract dirt, remove stubborn spots and spills, help eliminate odors, and restore color, leaving your carpet looking and feeling fresh. Trust our professional carpet cleaners and equipment to provide the best carpet care and cleaning available. 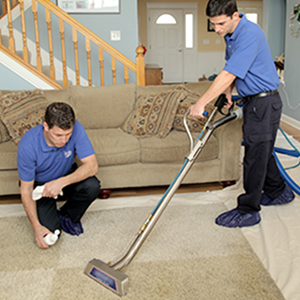 A special heated carpet cleaning solution is sprayed deep into the carpet fibers to loosen embedded dirt. This is more than steam cleaning. Our carpet cleaning equipment penetrates farther down to lift the stubbornest stains and odors. It’s followed by a high-powered hot water extraction and pH-balancing fiber rinse to remove the dirt and cleaning solution, leaving your carpet as clean as it can be. . The Importance Of Regular Professional Cleaning. Sometimes carpet dirtiness is obvious, but your carpet is dirty before you can even see the dirt on the carpet fibers. The way carpet fibers are made conceals the dirt, which works its way down into the fibers due to normal traffic. The dirt remains in the carpet where it gets ground in through daily use. This grinding can cause damage to the fibers, dull the color, and create an unpleasant odor in your home. Dirt, dust, dander and more can also aggravate allergies and asthma symptoms. If you want your carpet to look great for a long time, invest in carpet cleaning services at least once a year or more often if traffic in the home dictates. A professional Sears carpet cleaning removes damaging dirt, and an application of carpet deodorizer helps freshen your carpet. Regular carpet cleaning also helps keep the color of your carpet more vibrant. Once your carpet has undergone professional cleaning, we recommend the optional application of the UltraCare™ Fourguard Carpet Protector. This carpet protector restores the protective coating on your carpet, making your cleaning last longer and allowing for easier home cleanings. New Carpets typically have carpet protectors applied during manufacturing. However, this protector wears off over time with repeated foot traffic and vacuuming. Having Sears re-apply the carpet protector refreshes the carpets performance. It allows you to pick up more dirt with your vacuum to help keep your carpet cleaner and it slows down how quickly liquid spills soak in, so you have time to clean up spills. A not-so-fresh carpet can lead to a smelly home. Unfortunately, guests and visiting relatives can quickly detect the odors your carpet contains. Pet odor, in particular, can be the cause of these smells, but several other natural organisms could be contributing to carpet odor. Our UltraCare™ Pet Odor Eliminator uses enzyme-powered elements to fight odor-causing sources. These enzymes can target odors from vomit, urine, feces, sour milk, and other organic products by actually digesting these organic substances. Once applied, these carpet deodorizers swallow up the odor-causing culprits to leave your carpet smelling fresh. 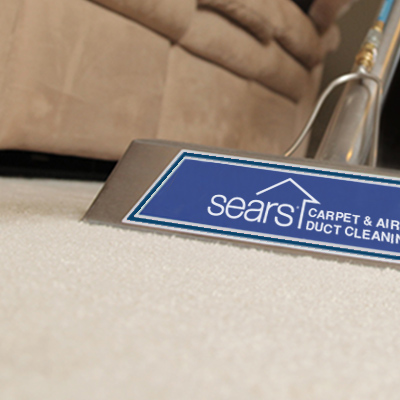 Only a professional carpet cleaning from Sears can guarantee you an odor-free home. Investigate companies to find the one whose employees you trust with your home and belongings. Ask about the cleaning solutions and equipment used during the cleaning process. Sears Carpet Cleaning and Air Duct Cleaning offer an unparalleled carpet cleaning system that removed dirt and restores carpet to its former fresh state. Our process follows the guidelines and recommended processes for effective carpet cleaning recommended by America's largest carpet manufacturer. Did you know? Most carpet manufacturers require regular, professional carpet cleaning in order to maintain your carpet's warranty? Check out these manufacturers for more information.